While the benefits of reading aloud to your children can not be denied, your children reading aloud to you is extremely important too. 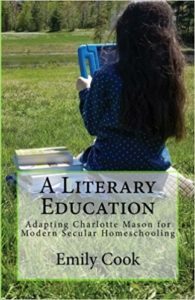 I have discussed the importance of reading aloud at great lengths, covering many different topics from why you should read aloud, to how to make it happen during your daily routine, how to prevent read aloud sabotage, and all the way to continuing to read aloud to your children well in to their teenage years. 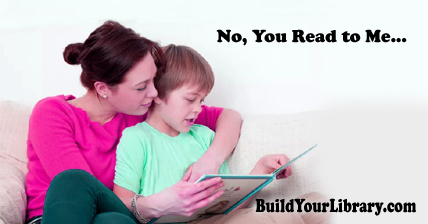 Today, I’ll be talking about why you should also have your child read aloud to you on a regular basis. Typically when you child is learning how to read, you take plenty of time to have them sound out words, read simple sentences and eventually, graduate to easy reader books. All out loud, for you to hear. Then, independent reading replaces just about all of their reading aloud as they move on to starter chapter books. Reading alone is an important skill and we should encourage it. But it shouldn’t be the end of learning to read. Sure, you are a pro at reading aloud. You are an adult, you have been reading picture books to your children for years, perhaps you were on the debate team in high school, or took a public speaking class in college. Maybe not, but somewhere along the way you picked up that skill. Because that’s what it is – a learned and practiced skill. Throughout the Build Your Library curriculum, memory work is assigned. Your child memorizes a poem, or speech, or monologue for several days, or weeks, before finally reciting to a small audience. Mom, dad, siblings, perhaps grandparents too. The benefit of this is two-fold. First, it is helping teach your other children to be quiet and respectful of someone else’s turn to talk. But also this is public speaking, to a small and familiar group of people (possibly with the need to overcome and ignore minor distractions). By reciting a memorized piece, your child gets to learn how to enunciate, speak with feeling and emotion, project their voice, not to mention filling their minds with worthy ideas and beautiful words. But memory work isn’t the only way to work on these skills. Continuing to have your children read aloud on occasion will help to build their speaking muscles. As your child’s reading level increases, certain passage may also become increasingly challenging. When reading on their own, it may be easier to skim over it quickly in their head, or simply read too fast and miss out on some of the reading comprehension. Your child will undoubtedly come across words that they might have never before heard pronounced. I’m sure I wasn’t the only person who pronounced the word “hyperbole” as “hyper-bowl” before finally hearing “high-per-bo-lee” said aloud correctly. Giving your child the opportunity to read aloud to you will help you and your child to catch those sorts of mistakes BEFORE they ever have the chance to get embarrassed in public for mispronouncing a word they only ever read. Have you ever asked an older child to talk about something they just “read”? Have they ever sat there with no recollection of what they’d literally just finished reading five minutes prior? Do your children yell in their “outdoor voice” when talking at the kitchen table about Pokémon cards, but barely speak over a whisper when giving a presentation about Ancient Greece to their co-op? Having them practice reading aloud to you a few times a week will help them build the speaking and comprehension skills they need to know. It takes practice. And when public speaking practice covertly occurs while reading a chapter or two from their already assigned lesson, it doesn’t always seem so bad. Take turns during your normal read alouds, or have them read a chapter to you before they start reading to themselves. I call this “Buddy Reading.” My children have always loved it when we buddy read. It gives them special one-on-one time with Mom’s undivided attention AND we get to share a story together, just the two (or three) of us. I choose books that are right around their reading level or just slightly above, and we bounce back and forth every page or two. Sometimes we compete to see who can do the best voices, or we just work on carefully enunciating our words, always with me demonstrating the skill I want them to work on most. This shared reading experience is much more than just reading instruction. It’s like a special book club, just for the two of us. We don’t do it every single day, or with every single book – but it is a practiced and regular occurrence. Maybe you have several children and the idea of buddy reading with each of them sounds overwhelming. Instead, you might have each of your children rotate throughout the week reading aloud a few pages from their current read-alone. This gives you all the benefits of buddy reading without the time-commitment to juggling different books with each of your children. You can still ask them questions to gauge their comprehension and if you want to work on reading skills (like emotion and enunciation) you can still do that with a few pages of a book once or twice a week. We want to raise children who aren’t just readers, but good communicators as well. Being able to clearly and coherently discuss ideas (in speaking AND in writing) with other people is possibly the most important thing we can teach in our homeschools. Giving our children the opportunity to read aloud on a regular basis will give them the skills they need to become confident speakers in the future. You never know when your child will be tasked to read a passage of the Magic: The Gathering rulebook to settle a dispute at table full of friends while playing cards, or give a Powerpoint presentation to a boardroom full of executives when they are much older. Perhaps then, reading Along Came a Dog aloud to mom all those years ago won’t seem so silly after skillfully and confidently completing that task. Have you seen our Family Reading Crates? With an opportunity to read aloud, buddy read and read alone every month, our Family Reading Crates are an excellent way to read, read, read! Each themed box is packed with a picture book for younger children, a middle grade family read aloud, a book for older readers, and a book for you, the parent – as well as a booklet with additional activities and resources. It’s like getting an all-inclusive family-wide unit study in a subscription-style book box each month! Read everyday. I Love Books. I completely agree with this. A couple of years ago I started doing a round robin reading book with my kids. We still do it and I have an 16,12,12 and 8 y/o still at home. I pick books that I want them exposed to that maybe a little harder or sometimes it just a book I want them to have read (right now we are reading “Heidi” my 12 y/o boys would not want to read this otherwise) it has been such a good experience even when they complain about my choice of a book. Usually by the end they have loved what we have read.